At about mid-season this year, Robert Kubica became everyone's favorite for the drivers' championship. It was not that anyone thought he had a genuine chance of taking it at the last (although he surprised us by remaining in contention until the last two races), but rather that the others were making so many mistakes that it seemed slightly unfair that one of them should be champion. That attitude has stuck and there are still some who say that Robert deserved to be champ. I think this is pushing things a bit too far, although I would have loved to see the Pole win; F1 is a team sport and each driver shares in the fortunes of his employer. If BMW could not supply Robert with a winning car, then that is the way things were and we can only applaud his achievements in coming so close to the title - but to go beyond that and suggest that he "should" have won ignores reality. Should Fernando Alonso have won the drivers' title while he was driving for Minardi? An essential part of winning the championship is being in a car that is capable of winning it. Very occasionally a driver will be able to make up the difference and win in a car that is not the best; but in that case his car will not be much worse than the quickest. There is only so much a human can do to compensate for mechanical deficiency, after all. This year, Kubica has demonstrated how much can be achieved through talent, consistency and persistence. Although his challenge faded in the final two races of the season, that was not his fault, the team having transferred much of its effort to the new car for 2009, and his reputation suffers nothing by being beaten to third place by Kimi Raikkonen. He is accepted now as a star of tomorrow, one of the fastest drivers in F1 and a future champion. My feeling is that he will not achieve his full potential while with BMW, however. His frustration at being trapped in a car that was falling behind the leaders in development became obvious in the second half of the season and he was not afraid of criticizing the team, both for its decision to concentrate on next year and for spending too much time and effort on solving Nick Heidfeld's problems. Contrast this with Heidfeld's quiet work to overcome his problems and it becomes apparent that Kubica is not the team player that Dr Theissen might prefer. Consider what BMW have done for Robert already. He was given a chance when the team still had a driver signed to race and they stuck with him even when the contracted driver threatened to leave. Dr Theissen set realistic goals for the team in both 2007 and this year and they achieved them both. Robert had a difficult first year, being well beaten by Heidfeld, but BMW believed in him and persevered, thereby giving him the chance to shine in 2008. To complain now about time spent on Nick is hardly fair payment for the team's faith in him. But that is the way champions are and it bodes well for Kubica that he be so demanding. Until recently, he seemed to be quietly getting on with the job but his dissatisfaction of late has revealed a more aggressive and determined side to his nature than we suspected. He will need those traits if he is ever to be champion. Nick Heidfeld may be uncomplaining and honest, but these are the qualities that undermine our belief that he could be a winner - nice guys come second in this game. Which does not mean that I give up on him as a future champion. He has the speed, racecraft and consistency to do it and is with a team that improves every year and has been loyal to him. What it means, however, is that, if Heidfeld is ever to be champion, he will do it in a BMW. Robert is more likely to move to Ferrari or McLaren in his quest to be WDC. That may seem a lot to extrapolate from a few remarks from the Pole during the season - I am speculating, it's true. Think of how Dr Theissen must feel in all this, however. He is balancing many conflicting priorities in managing the team and had to make the decision of when to begin work on the new car. Realistically, there was never much chance for Robert to win this year - he was too dependent on mistakes by the front runners. But the constructors' championship was an outside possibility and it was in the interests of the team that Heidfeld score points too. Hence the work the team put into him. The Doctor gave lip service to Robert's demands for continued development of the car but still kept his eye on the future of the team. The result is that BMW now feel confident enough to make the championship their goal for 2009. 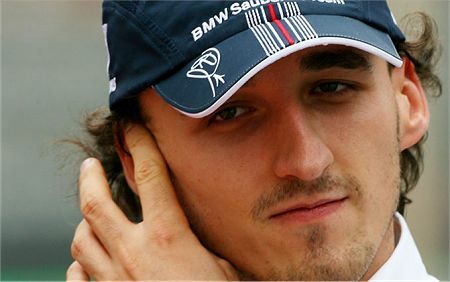 Kubica may benefit from that, although we should not necessarily expect his ascendancy over Heidfeld to continue into the new year. Much depends on the characteristics of the F1.09 and it may suit Nick better than Robert this time out. Note, too, that BMW talk of "the championship" without defining whether it is the constructors' or drivers' title they want. I suspect that their primary goal will be the constructors' and Dr Theissen will let the drivers fight it out for the WDC. Whatever happens, I reckon that we will see Robert move on at the end of next year, most likely to McLaren, since Ferrari seem so set on Raikkonen and Massa. If that happens, it will be quite entertaining to watch the battle between Robert and Lewis Hamilton - two drivers who are expected to be leading contenders in the years to come. And do not suppose that Kubica will be another Kovalainen in that case - I think the fireworks will rival the year of Alonso at McLaren! I don't see Kubica going to McLaren. First because there is no way he will win in the same car as Hamilton. If he is not happy about the amount of attention Heidfeld is getting at BMW then he is going to be a lot less happy at Woking. The other think is Lewis likes an oversteering car and Kubica does not. The final nail in the McLaren coffin is that they are quiet clearly setting Paul di Resta up to be Lewis's team mate in 2010 or 2011. Kovalainen is simply keeping the seat warm. There is no way BMW can seriously challenge for a championship next season. THey have yet to win a single straight race. They won in Canada but that was only because Lewis took both himself and Kimi out. Until BMW can make a car that can beat the best car and driver combinations on at least one circuit they are not a serious championship threat. One thing is for certain, 140 days is too long to wait for the season to begin ! I don't think I have ever anticpated a new season so much before. The prospect of the usual McLaren/Ferrari battle with Renault and BMW-Sauber thrown in for good measure is just salivating ! Kubica is still in my bad book :-). But after he`s biggan in 07 (at the circuit thats been dropped etc etc) its good to see he`s still racing hard, perhaps Kovi didn`t fair so well after Bahrain. This is such a mouthwatering period in F1, with the FIA opening themselves to scutiny, because they played all there trump cards and got spotted, to slick tyres and battery boost, with aero luditeism. I have never considered myself a luddite before but if next year's regs are aero ludditeism then a luddite is what I am. I love technology in all its forms except one. Technology kills racing. We have aerodynamics advanced to such a degree that racing cars can't race each other and we have been left with pit stop grands prix. I am totally in favour of the elimination of all the aerodyanmic add ons next season and only three things concern me about next season's regs. KERS is stupidly pointless and will discriminate against heavy drivers. Adjustable aero and push to pass will kill racing. Full width front wings are going to lead to races being ruined following minor contact. I am in favour of the aero ludditeism though. Has anyone seen my sabots? Steven: I don't think Paul di Resta is necessarily a definite for McLaren in 2010. Word at the moment is that he is likely to be in a Force India by that time, whether or not he is part of the engine and drivetrain deal. As for Kubica beating Hamilton, that remains to be seen. Robert has to believe he can do it, at least, and he will go to any team that can offer him a winning car. This is presuming that BMW do not build a world beater for next year, of course. Robert's frustration will make him leave the team in that case. But I would not be too hasty to say that the F1.09 cannot be equal to or better than the Ferrari and McLaren offerings. the gap to the rest is particularly narrow at present and the new regulations make it entirely possible that the pecking order will change. So far, BMW has delivered on every goal they have set themselves. Next year the stated aim is "the championship" and it is well within the bounds of possibility that they achieve that. We shall see. Peril: Agreed, it is a long, hard slog between seasons, especially for bloggers. I was anticipating next season well before this one ended! Gusto: Yup, there is a very interesting season coming up - big changes and unpredictable results.